Alexander Buchanan Campbell (b. 1914)’s most significant project is the Dollan Baths. This was the first Olympic-sized swimming pool to be built in Scotland. Located in a prominent position in the Town Centre Park on the crest of Brouster Hill, the swimming pool is a focal point for East Kilbride, the first New Town to be built in Scotland. It is named after Sir Patrick J Dollan, the first Chairman of the East Kilbride Development Corporation and celebrates East Kilbride’s status as a burgh, which was granted on the 16th May 1963. Commissioned directly by the Town Council, work began on the swimming pool the following year. In 1968, twenty-one years after the birth of East Kilbride, the Dollan Baths was opened to the public. Costing the Town Council £600,000, it was built by general contractors Wight Construction Limited with consulting engineers T Harley Haddow & Partners. It consists principally of pre-stressed concrete and gives visitors the impression of a marquee, as the billowing vaulted 324ft parabolic arched roof appears to be held down by pairs of ‘V’ shaped-struts that crash to the ground at a 30° angle. 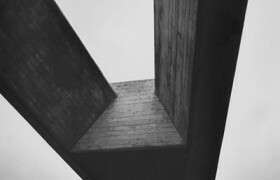 Buchanan Campbell originally considered using laminated timber for the roof because it would have aided the reduction of condensation, but transportation proved difficult and so the practical and expressionistic advantages of reinforced concrete won the day. The swimming pool is composed of four elliptical shell structures and fan five longitudinal pre-stressed concrete ribs. Its main longitudinal arch thrust is held by six pre-stressed concrete ties, which are fixed into the abutment foundations. 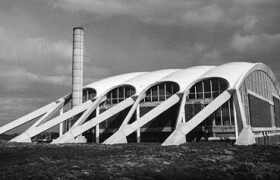 The innovative flamboyant concrete shell structure attracted visiting engineers from Russia during its construction and its daring modernist design invites comparison with other contemporary architects such as the Italian structural engineer, Pier Luigi Nervi (1891-1979). Buchanan Campbell had travelled to Japan before designing the Dollan Baths and may have been inspired by the plastic exuberance of Kenzo Tange’s (b.1913) design for the National Gymnasium for the 1964 Tokyo Olympics. In an interview in 2003, Buchanan Campbell said: ‘I had been to Japan …before my swimming baths….probably unconsciously I was sipping everything in…’. Two pools are accommodated within the structure, a larger one with a maximum depth of 14ft, and a smaller teaching pool. 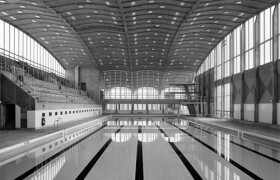 Features showing that the building was designed with championships and competitions in mind include spectator seating for 600 people, which was provided on raised concrete banks at the north side. The drawings also show electrical points for television equipment, speakers and telephones in the pool surround. Just a year after the pool had opened, its imperial dimensions proved to be problematic. 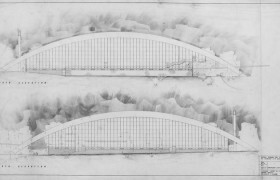 A drawing, dated 1969, shows how the 55 yard long pool could be altered with an aluminium partition so that it met the standard 50 metre Olympic length. A small underwater window in the entrance hall announces to the visitor the building’s purpose and would have given visitors a sectional view of divers through the side of the pool and TV crews the opportunity to take underwater action shots. Curtain-walling provides swimmers and spectators alike with views of the surrounding park, and brick screens were introduced to the design at various intervals to prevent divers being disorientated by glare from the sun. The diving boards were removed when the building underwent additions and alterations in the mid 1990s at a cost of £4.5m. In 1994, the Newcastle-based firm Faulkner Browns finalised the shortening of the pool by adding a hinged plastic boom to the width so that it met the Olympic dimensions of 50m by 12m. They also added a floating floor so that the depth could be changed according to need. The original teaching pool now functions as a toddlers’ pool and flumes have been installed in the North West corner. In response to changing social attitudes, a unisex ‘changing village’ at the pool level replaced the original separate male and female changing accommodation to provide greater flexibility for families. Originally, air was heated in the basement by coal boilers that also heated the adjacent youth centre (which was also designed by Buchanan Campbell in 1966-70), it was then supplied to, and extracted from, the main pool hall by a series of ducts built into the ceiling void. As testament to Buchanan Campbell’s design, little work needed to be carried out on the exposed concrete shell of the roof. However, services and structural engineers Ove Arup & Partners replaced the mechanical and electrical services and redesigned the service controls and patterns of air distribution. The ductwork was renewed, a new plant was installed and exhaust vents were fitted with heat exchangers. A glazed conservatory was installed beneath the concrete buttresses with maple-veneered screens and counters to replace the original exposed concrete reception desk in the entrance area. A cantilevered glass and steel canopy was also added, acting as a foil to the powerful sweep of the monumental concrete struts, marking the entrance, and also deterring vandals from climbing up onto the roof. Indeed, the original plastic quality of the concrete buttresses also has a playful aspect – most tempting to youngsters – that can be compared to the 1960s concrete play structure that still stands, somewhat neglected, in the north east end of the park. The struts would also have echoed the shape of the original concrete diving-board structures and the arc of the divers themselves. In 1993/4 the Baths were included in DOCOMOMO’s descriptive register of sixty key monuments of Scottish post-war architecture and has since been awarded A-listed status. The swimming pool has also been preserved on paper: Buchanan Campbell’s architectural drawings, models and photographs are now accessible to the public.